It is exceedingly difficult to simulate large numbers of interconnected biologically realistic neurons, even when simplified neuronal models that substantially reduce the computational requirements per neuron are employed. Computer CPUs can only solve for the behavior of a single neuron at once, meaning the total computational time is to at least N, the number of neurons, and up to N2 for densely connected networks. Multi-core processors, cluster computing, and parallel programming techniques can alleviate this problem somewhat, but not enough to make it feasible to simulate more than a few tens of thousands of neurons in a reasonable period of time. We have designed what appear to be biologically realistic neuron models using superconducting circuits known as Josephson junctions. Josephson junctions, used in a wide variety of applications, make use of a quantum-mechanical effect to produce a non-ohmic current between two superconductors separated by an insulator. We have found that a particular circuit containing Josephson junctions behaves in many ways like a biological neuron. By comparing numerical solutions of the voltage and current equations for the Josephson circuit with simulations of several well-known biological models, we have found striking qualitative similarities. 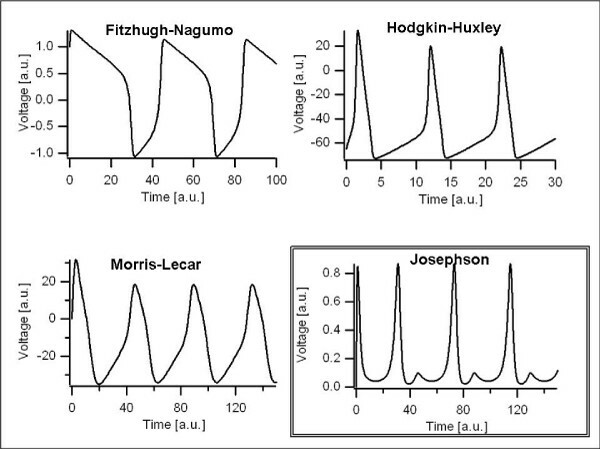 The "Josephson neurons" produce stereotypical voltage spikes similar to action potentials in response to external currents (Figure 1), they have firing thresholds, and they exhibit refractory periods. Josephson neurons can be coupled together in a way mimicking an excitatory synapse: the resulting joint behavior of the Josephson neurons is very similar to that of coupled biological neuron models, for example in reproducing self-sustaining oscillations (Figure 2). While much work remains to be done to establish the precise degree of agreement between the Josephson and biological neuron models, our indications thus far are that the Josephson neuron is as good at modeling biological neurons as many models currently in widespread use. 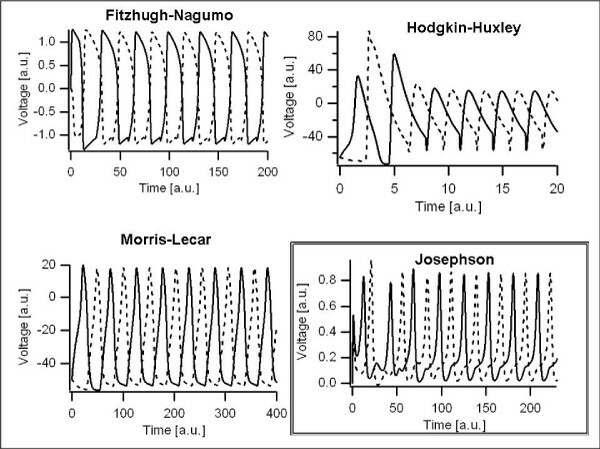 Josephson neuron action potentials compared with biological models. Self-sustaining two-neuron oscillations in the Josephson neuron and the biological models. Josephson neurons are easy to design and fairly inexpensive to fabricate; a thousand could be placed on a single chip. They would operate fully in parallel, meaning a single Josephson neuron in isolation would run just as quickly as a thousand fully interconnected ones. And they would be vastly faster than either computer simulations of neurons or actual biological ones: a Josephson neuron action potential lasts on the order of a picosecond, roughly a billion times shorter than a biological action potential. Josephson neurons may therefore provide a way of overcoming the traditional time and scaling problems of computational neuroscience.